A delicious chili with black beans, kidney beans and beef and a spirited classic chili taste reminiscent of the Wild West. As a pioneer in the food marketplace for over 30 years, we have a reputation for excellence surpassed only by our distinction for outstanding taste. We produce freeze-dried and dehydrated, instant meals, side dishes, breakfasts, soups and desserts. A delicious chili with black beans, kidney beans and beef and a spirited classic chili taste reminiscent of the Wild West. As a pioneer in the food marketplace for over 30 years, we have a reputation for excellence surpassed only by our distinction for outstanding taste. We produce freeze-dried and dehydrated, instant meals, side dishes, breakfasts, soups and desserts. Our products can be used every day but also for backpacking, hiking, hunting, fishing, and long-term food storage. We offer selected items for those who are gluten-intolerant. Naturally Good Food... Anytime/Anywhere. 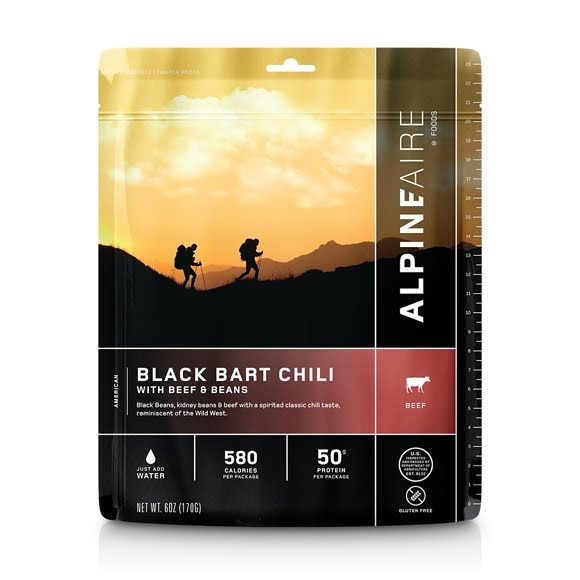 INGREDIENTS : Cooked Freeze-Dried Diced Beef, Crushed Pinto Beans, Crushed Black Beans, Tomato Powder, Potato Starch, Chili Powder, Low Sodium Salt, Tomato Flakes, Mixed Red and Green Bell Pepper, Garlic Granules, Cumin, Chopped Onion, Jalapeno Powder, Basil, Oregano.